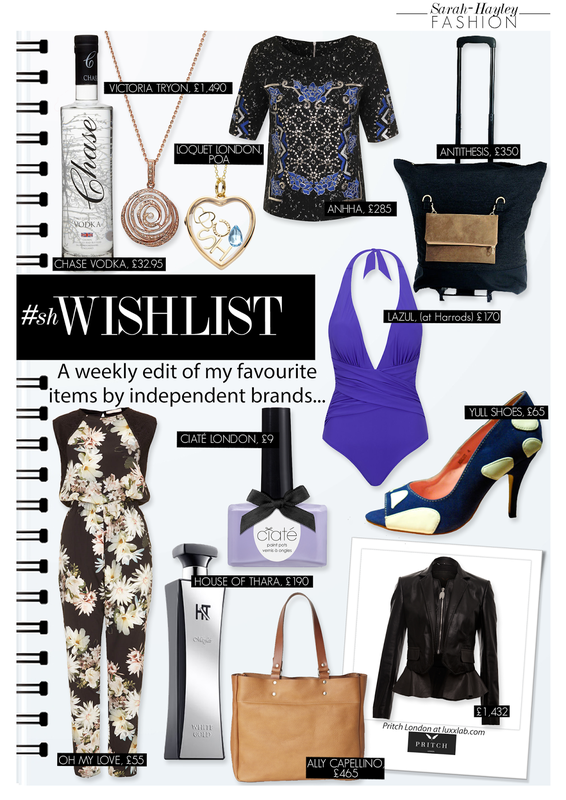 FOUR - The #shwishlist - A weekly edit of my favourite items.. This weeks #shwishlist is inspired by the brands I have admired for a while and also features a labels who I have had the pleasure to work with. Chase Vodka has become the drink of choice for the fashion crowd. I first tasted their refined potato vodka at an event hosted by Mulberry. I was then allowed even more opportunity to enjoy Chase cocktails when they became the sponsor of Cheltenham Fashion Week. The vodka is made from the same potatoes which created the delicious Tyrrell's crisps. Chase Distillery is the first and only company to produce an English Potato Vodka and are based in Herefordshire. Once you have tried the Vodka then try the Gin, it's my favourite and trust me, after you have tried one G&T there's no turning back! You may recognise Victoria Tryon's beautiful creations from my fashion editorials. This stylized rose design is from the Vanity Collection and made from 18kt rose gold set with champagne diamonds. It is a piece that you know you could wear forever. I first discovered Yull shoes at the Best of Britannia show in London. Sarah Watkinson-Yull is the woman behind the brand and established Yull in 2011, at the age of 21. The following year Sarah received funding from the Prince's trust to set up manufacturing in the UK. Today, Yull is one of the only independent shoe brands manufacturing high heels in Britain. I fell in love with the the cobalt blue and white Ascot shoes when I called in samples for Cheltenham Cricket Festival as I was asked by Cheltenham Fashion Week to style a glamorous catwalk show for Ladies Day, everyone loved them! My friend introduced me to the new covetable jewellery brand Loquet London during my trip to Paris for Couture week in January. The brand is a collaboration between, model, Laura Bailey and her friend Sheherazade Goldsmith creating a luxury line of contemporary keepsake lockets. The two friends have updated the look of the 'Loquet' adding 18kt gold crystal frames and unique personalisation, allowing the addition of a variety of collectable charms. This process is also a chic step-by-step method, on the designer page of the Loquet website. For my design I have used charms that are personal to me, my initials S-H, my birthstone - Aquamarine, a double heart which I am using to represent me and my Mum and a horseshoe representing my Cotswold home where I am surrounded by horses. After designing your own Loquet, you can save it to your online wishlist, a moodboard for all your designs. This would be a dream gift and mine is now on my - say it quickly..30th Birthday - gift wishlist! I always love to discover new brands and also enjoy researching. When I was studying for my degree in Womenswear I loved the research stage so much I didn't want it to end. Thankfully research is a large proportion of my job and this week I have found two new brands, AnhHa and Antithesis. AnhHa is a ready to wear label based in London, established by Anh Trieu and Ha Dang. The SS14 collection uses hand embroidery and beading as the detail of the designs. As I specialised in Surface Pattern Textiles at LCF, I am mad on embroidery and AnhHa fulfill my textile dreams with their intricate designs influenced by their Vietnamese culture and London lifestyle. Antithesis is a brand based on the collaboration between Renée Lacroix and Zahra Ash-Harper. The fashion label produces high quality and trans-seasonal collections that stand alone from fast fashion and trends to create pieces that can be worn for many years to come. The Antithesis Ultimate Travel Bag is the perfect item for anyone who travels, as the versatility of this bag is incredible. Firstly it is cabin size which is wonderfully convenient and secondly the d-rings and hooks allow multiple ways to carry the bag. There is even a short film about the other innovative features. All of my #shwishlist products are pinned to the #shwishlish pinterest board to allow a closer view. If you would like to recommend a brand or item for #shwishlist, email: moi@sarahhayleyfreelance.com or tweet me with the hashtag #shwishlist.